This original bridal entrance song, Here She Is - My Cherished Bride, is available as an MP3 download, along with an illustrated lyric sheet and CD jacket cover. This song is designed to be played as the bride enters the room for the wedding ceremony. You can copy the MP3 file to a CD and print the lyric sheet to include in the wedding book or frame to place on the wall. You can also print the CD cover image to insert in the CD jacket. 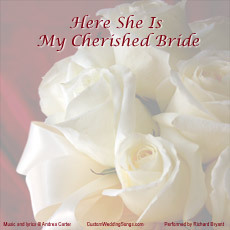 Andrea Carter is the composer and lyricist and Richard Bryant is the vocalist on the recording. The playing time of the full-length song is 1 minute 38 seconds. 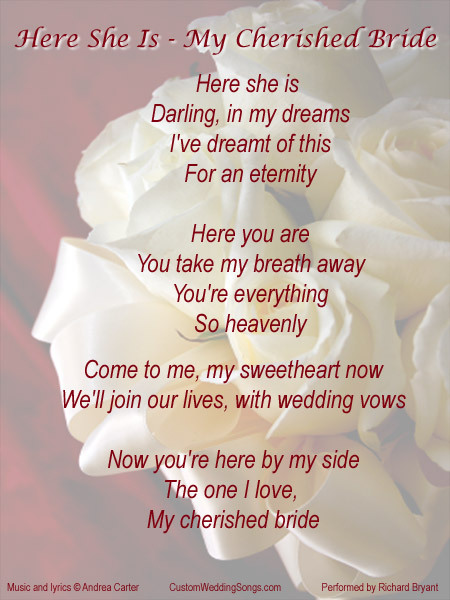 Click on the "Buy Now" button below to order your download of this original bridal entrance song in MP3 format, along with higher quality versions of the lyric sheet and CD cover illustrated above, for only $9.99. You must go through the PayPal checkout procedure to complete your order. We also offer personalized bridal entrance songs and other wedding songs with lyrics based on the lives of the bride and groom. See our Personalized Songs page or Contact Us for additional details.